Computer Backpack perfect for a laptop and more. Fully embroidered with the Alumni logo and two lines of text. Computer Backpack perfect for a laptop and more. Fully embroidered with the Wood Badge logo and two lines of text. Messenger Briefcase perfect for a laptop and more. Fully embroidered with the Alumni logo. Messenger Briefcase perfect for a laptop and more. Fully embroidered with the Wood Badge logo. 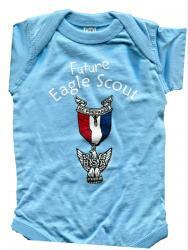 Future Eagle Baby Bodysuit - Great Gift and now available for a boy or girl.